Performed by Claudio Maccari and Paolo Pugliese, with the orchestra Ensemble Ottocento. 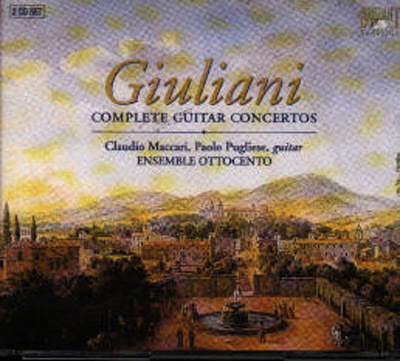 The two CDs contain all three of Giuliani's guitar concertos opp. 30, 36 and 70, and also the Gran Quintetto for guitar and string quartet op. 65 and the Variations for guitar and string quartet op. 102. For the detailed list of contents see below. The performers are Claudio Maccari and Paolo Pugliese, playing on guitars of the period with the technique of the period and interpretation on historical lines, with the orchestra Ensemble Ottocento which also plays on original instruments of the period or on replicas. The performances fizz with life and musicality. Colin Cooper reviewed these CDs in Classical Guitar magazine for May 2007 and liked them a lot. He wrote, for example: "Giuliani comes out of the enterprise with a new stature. Performed at this high level, nothing sounds weak or inadequate. The wind department produces sounds that are no less than enchanting ... "